Swedish truck maker Scania has released further details about its next-generation heavy-duty range, explaining the concepts behind its latest creations. Utilising designs that began to be developed in 2004, when the company was preparing to launch its R-Series range, Scania says it sought understanding from its customers and market segments to find out what the truck cabs of the future would encompass. This research included "in-depth studies from ergonomists, different conceptual ideas, and personas (imaginary typical customers)," Scania says, which in turn became proposals of "possible solutions for how the driver environment, sleeping area, storage and other features could take shape, design-wise, in the future." This approach saw Scania move the front axle on the new range forward 50mm, allowing the position of the driver to be moved 65mm closer to the windscreen and 20mm towards the door. 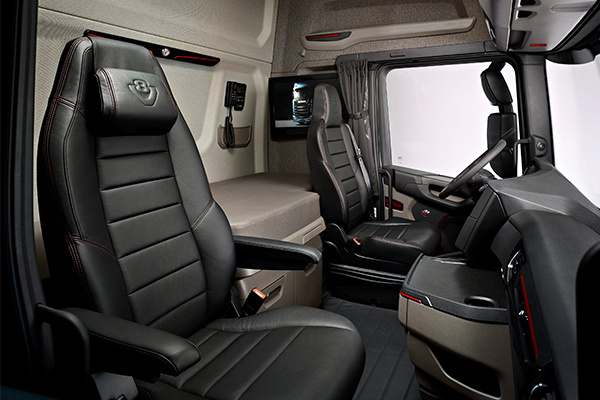 "Above all, this allows for major improvements in terms of driver safety, vision, and interior space," Scania’s head of styling and industrial design Kristofer Hansén says. "We also got more space for seat adjustment, storage and the bed. "Overall, it helped produce a truck that’s even easier to manoeuvre and has a whole new field of vision from the driver’s position." While developing the cab design, the team also developed a tagline, Hansén says. "With our work we aimed for what we sometimes called ‘masterful control of majestic power’," he says. "It was a description of an outstanding driver environment. "It’s what you, as a driver, feel when you have climbed up into the cab and have all that power under you. "It communicates directly with you through the wheel, the interior, the sound, colours and functionality." He says, rather than trying to hide its role as a working environment for professionals, the new cab should feel and driver like "a big, powerful premium car". 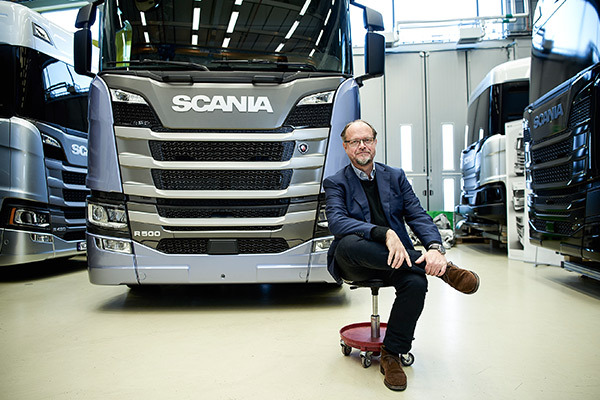 Scania’s head of styling and industrial design Kristofer Hansén. Built on a "desire to avoid the clumsy and huge dash units that are often found in trucks," Scania says the dashboard in its next-generation of heavy-duty trucks express a sense of "Agile Strength" and "Flexible Power". However, it is the clear intention from Scania to separate work from the rest of trucking life that will be of interest to the driving fraternity. The truck maker says its new design makes a clear effort to divide the driving seat from the passenger by a new ‘wing profile’ design. Residing on the profile is the dashboard itself, and, according to Hansén, it is about clarity. "The panel that the controls sit on is divided up into two segments, an upper and a lower part with an elegant horizontal step in the middle," he says. "This makes it easier to find what you’re looking for, you can support your fingers on it, and it makes selection easier and clearer than if we had used a big flat surface with the controls placed wherever." 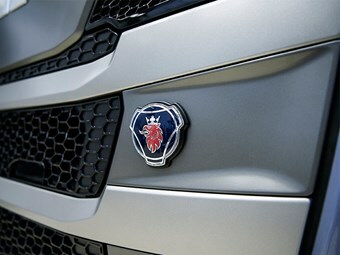 In a move that aims to continue the ‘luxury car’ feel, Scania says there will be a variety of materials, colours and textures on offer for customers, some of which emulate wood and metal finishes. When it comes to the way the truck looks to those it passes, the next-generation range hopes to ooze an agile appearance. Deciding on ‘athletic’ in 2007, the team at Scania wanted the trucks to be seen as a ‘thoroughbred’. "We shouldn’t be some big, strong lump – like a sumo wrestler – but rather a first-class race horse – a thoroughbred – without an ounce of extra fat around its muscles," Hansén says. "This, of course, all corresponds with the fantastic engine that we’re known for." This meant the team wanted a big front and aerodynamic advances. "For this reason, the design language is now more controlled, with sharper lines but at the same time a more accommodating roundness, instead of extreme angularity or simpler, trendier, round areas, which it would have been significantly simpler to build up a design around," Hansén says. 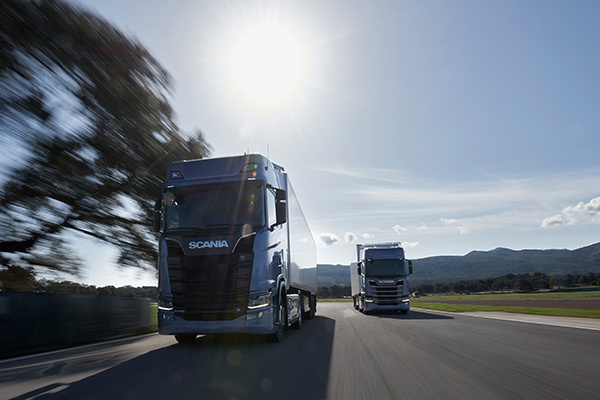 The next-generation Scania trucks range was launched last week in Paris. Full details from the launch are here.